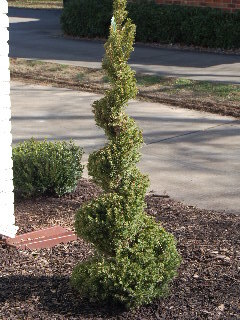 Here’s a great little dwarf evergreen tree to add into your home landscape. The foliage is relatively soft to the touch and the evergreen nature of this tree makes it a source of year-round visual interest. The plant can be grown in its traditional conical shape, or it can be pruned and sculpted into a variety of interesting and eye-catching shapes (like the spiral pattern shown in the accompanying photograph). If planted outdoors and left to grow in its traditional shape, the Dwarf Alberta Spruce can then be decorated and lighted seasonally as a living Christmas tree. And, Christmas tree or not, this little evergreen works perfectly when added to your home landscape as either a foundation planting or added into beds of other low growing seasonal foliage, evergreens, or blooming annuals. Just make sure the Dwarf Alberta Spruce is not planted too close to the house or other structures, as unimpeded airflow is necessary in order to maintain healthy vigorous growth and freedom from browning out of the needles. The Dwarf Alberta Spruce is a very slow growing species, achieving a height of probably not more than 8 to 10 feet over a period of many years. The little tree, even in a state of complete health and vigor, will not add more than 2 or 3 inches to its height on an annual basis. Its small size and slow growth also make it a desirable species to cultivate as a container plant, making it a featured visual item on your deck, porch, or patio. Just make sure your little spruce tree gets full sun (or nearly so), as this is one of the most important requirements for health and longevity. Another important consideration in maintaining the health and vigor of your Dwarf Alberta Spruce is adequate water, especially during the first growing season if planted directly into your landscape and at all times if planted into a container. By this, we don’t mean over-watering or drenching to the point of soggy soil (which can actually kill the plant), but rather adequate watering to help establish the root system during the critical first year of growth. And, hot and rain-free summer periods can quickly dry out the soil in containers. The Dwarf Alberta Spruce is not overly demanding of soil types, though a loose well drained organic soil is more desirable than a denser sticky clay soil. Mulch added to the surface layer (shredded hardwood bark or pine bark or needles) helps conserve the moisture around the plant’s base and roots and also discourages the growth of weeds. Dwarf Alberta Spruce is not overly burdened by pests, although spider mites can become a problem. If this happens, you might be able to get rid of them with periodic moderately strong dowsings with the water hose, or spray them with a mild insecticidal soap. Light annual feedings with a balanced fertilizer in the early spring (and maybe a light pruning for shape and form) is about all the additional care your Dwarf Alberta Spruce needs for continued growth.